Harden off half-hardy plants by leaving them outside during the day and bringing back under cover at night for up to 10 days before planting outside. Harden off dahlias and tender exotic plants such as Cannas. Plant out as soon as the risk of frost has passed. There’s still time to divide herbaceous perennials, which will give them a new lease of life and create new plants. Divide Hostas as new growth appears. Trim back Aubretia, Alyssum and Candytuft after flowering, to encourage fresh new growth and more flowers. Allow spring-flowering bulbs to die down naturally. Lift Forget-me-Nots – will prevent spreading too far by self-seeding. Cut back Penstemons – if there are new shoots at the base, cut back all the old shoots. If not cut just above the lowest set of leaves. Take cuttings of tender perennials for example Fuchsia and Pelargoniums (geraniums) and use the new shoots of hardy perennials for cuttings aso. Softwood cuttings of herbs such as Sage and Lemon Verbena can also be taken now. Early-flowering Clematis – prune overcrowded and dead stems after flowering. Cut back shoots of Choisya that have finished flowering to promote a second flush of flowers in autumn. Trim lavender plants – remove old flower heads and about 2.5cm (1 inch) of the current year’s growth. Climbing and rambling roses and lay the stems horizontally to help the production of more flowers. Sweet peas – will encourage them to climb. 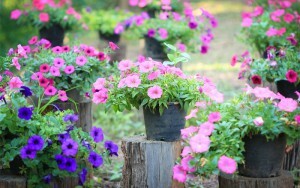 Give container plants a balanced liquid feed every two to four weeks to promote healthy growth. Plant up pots and baskets with summer bedding and harden off . Wait till weather warms up before placing in position. Continue to all areas to prevent competition for water and nutrients. Check new plants – early prevention is easier to handle than a cure. Remove larvae from rosemary, viburnum and lily beetles as soon as you notice them. Check roses for blackspot – if discovered treat with a systemic fungicide.